Is Africa’s surge of progress over? During the past two decades, many countries across the continent changed course and achieved significant gains in income, reductions in poverty, and improvements in health and education. But the recent optimism seems to have swiftly given way to a wave of pessimism. Commodity prices have dropped, the world economy has slowed, and economic growth has stalled in several sub-Saharan African countries. If high commodity prices alone drove recent advances, the prospects for further gains seem dim. But the reality is more complex, and the outlook—especially over the long run—is more varied than many now suggest. To be sure, many countries are confronting some of the most difficult tests they have faced for a decade or more, and even with sound management, progress is likely to slow in the next few years. But for others—especially oil importers with more diversified export earnings—growth remains fairly buoyant. At a deeper level, although high commodity prices helped many countries, the development gains of the past two decades—where they occurred—had their roots in more fundamental factors, including improved governance, better policy management, and a new generation of skilled leaders in government and business, which are likely to persist into the future. Managing the global slowdown—alongside other growing threats such as climate change—will require strong leadership, forceful action, and difficult choices. Overall growth is likely to slow in the next few years. But in the long run, the outlook for continued broad development progress is still solid for many countries in the region, especially those that diversify their economies, increase competitiveness, and further strengthen institutions of governance. 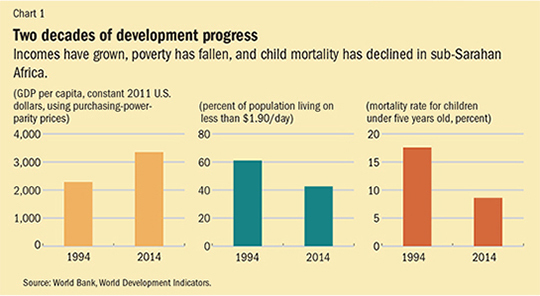 The recent slowdown follows two decades of strong progress, at least for many countries, that began in the mid-1990s and included faster economic growth, higher incomes, declines in poverty, widespread improvements in health and education, and other development gains (see Chart 1). Since 1995 GDP growth across the continent has averaged about 4.3 percent a year, fully 3 percentage points higher than in the previous two decades. But it would be misleading to suggest that rapid growth rates were universal across the continent. They varied widely, with about half the countries in the region moving forward and others changing little. In the 20 fastest growing countries—excluding oil exporters—GDP growth averaged a robust 5.8 percent for two decades, and real incomes per person more than doubled. But in other countries, growth was much slower, and in eight countries, income per person actually fell. Some of the differences are stark: in Rwanda real income per person more than doubled; in Zimbabwe it fell 30 percent. Where growth accelerated, poverty finally began to fall. The share of people living in extreme poverty (less than $1.90/day in constant 2011 prices) dropped from 61 percent in 1993 to 43 percent in 2012, a decline of nearly 1 percentage point a year for two decades. In some countries (for example, Senegal), poverty declined even more; in others (Democratic Republic of the Congo), not at all. The gains in health were even bigger. Since the mid-1990s the share of children dying before their fifth birthday has fallen more than half, from 17 percent to 8 percent. Remarkably, every single country in sub-Saharan Africa has reduced child mortality in the past two decades. Malaria deaths have fallen by half, and deaths related to HIV/AIDS and tuberculosis have both fallen by one-third. More than three-quarters of children are enrolled in primary school, up from just half in the 1980s. More than two-thirds of girls now complete primary school, which will increase their earning potential; equally as important, it means that they will have fewer children and that those children will be healthier and better educated (see “In the Driver’s Seat” in this issue of F&D). These trends bode well for the future, as they signal the beginnings of a strong human capital skills base. Four key forces helped propel the resurgence in the countries that moved forward. First, there was a marked improvement in governance, at least in many countries. According to the U.S. think tank Freedom House, the number of electoral democracies in Africa has jumped from just four in 1990 to 23 today. With democracy came better governance, including more political freedoms, less violence, greater adherence to the rule of law, stronger public institutions, a better business environment, and less corruption. The new democracies are far from perfect, but the differences in the quality of governance are reflected in the World Bank’s annual Worldwide Governance Indicators scores. 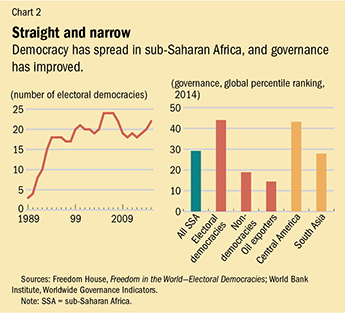 In 2014 the average governance rank for sub-Saharan Africa’s 23 democracies was the 42nd percentile globally (ahead of both India and China), while for the nondemocratic countries it was the 19th percentile (see Chart 2). A few nondemocratic countries improved governance, but these are exceptions rather than the rule. Second, there are more skilled leaders and policymakers. A new generation of managers, technicians, and entrepreneurs is rising to the top of government agencies, civil society organizations, and private businesses. The leaders in central banks and key government ministries are far better trained, more experienced, and more capable than their predecessors 20 years ago. Third, and related, economic and social policies have improved significantly. Macroeconomic management has been much more effective, with more flexible exchange rates, lower inflation, smaller budget deficits, and higher levels of foreign exchange reserves. Strong state control has given way to more market-oriented economic systems. Governments have removed many distortions that hindered growth, which led to more open trade, greater choice for farmers when it came to buying inputs and selling their products, less red tape, and a lower cost of doing business. It is partly because of these policy improvements that many countries were able to weather difficult global shocks in recent years, including the food crisis of 2007 and the global financial crisis of 2008–09. Fourth—the key condition that is now beginning to change—during much of the past two decades world economic conditions were generally favorable.Trade expanded rapidly and with that came access to new technologies and ideas, alongside bigger markets. China became both a big market for exports and a major source of investment in many countries. Interest rates were low, making borrowing for infrastructure projects far more affordable. And from 2002 through 2014, rising commodity prices helped the major oil exporters (Angola, Republic of Congo, Ghana, Nigeria, and others) alongside other resource exporters, such as Liberia, Namibia, and Zambia. Rising prices did not help all countries—the majority of African countries are oil importers that were hurt by higher prices, and many saw relatively little change in key prices—but commodity prices buoyed economic activity in much of the region. In addition to these four key forces, foreign aid played an important secondary role. Aid was particularly important in improving health, and helped save millions of lives through programs that increased access to vaccines, improved child health, and fought diseases such as tuberculosis, malaria, and HIV/AIDS. And the preponderance of academic research in recent years concludes that aid has helped accelerate growth on average and consolidate democracy in some countries, especially since the mid-1990s (for a good recent summary of this research, see Arndt, Jones, and Tarp, 2015). The view that Africa’s surge happened only because of the commodity price boom is too simplistic. It overlooks the acceleration in growth that started in 1995, seven years before commodity prices rose; the impact of commodity prices, which varied widely across countries (and hurt oil importers); and changes in governance, leadership, and policy that were critical catalysts for change. This broader understanding of the drivers of progress is crucial in considering the prospects for the future: sub-Saharan Africa’s long-term future will not be determined by the vagaries of the commodity markets alone, but by how well these and other challenges are managed. However, global circumstances have changed significantly, and many countries are confronting some of their most difficult challenges in a decade or more. Growth has slowed significantly around the world, including in several important export markets. Growth in Europe has slowed sharply, and the U.S. recovery remains modest. As growth has slowed, so has trade. World trade expanded by nearly 7 percent a year in the decade between 1998 and 2007, but since 2012 the pace has fallen by more than half to just 3 percent a year. Perhaps most important, China’s growth has dropped to about 6 percent, well below the pace of recent years. China’s trade with sub-Saharan Africa exploded from less than $20 billion in 2003 to more than $170 billion in 2013. But China’s weakened growth and its efforts to put greater emphasis on its domestic economy have led to a sharp slowdown in trade with Africa and a significant contraction in some countries, especially Angola, the Republic of Congo, Equatorial Guinea, South Africa, and Zambia—China’s main African trading partners. The changes are not all negative: the rapid rise in wages in China creates new opportunities for African countries to expand manufacturing. But the relationships with China are again changing rapidly, and managing them carefully will be central to continued long-term growth in many countries across the region (see “A Fork in the Road,” in this issue of F&D). With growth slowing, commodity prices have dropped significantly. The prices of corn, copper, and cotton have all fallen by more than 20 percent since 2013, and iron ore and oil prices have dropped more than 50 percent. These declines have had a wide-ranging impact on export earnings, budget revenues, investment, employment, exchange rates, and foreign exchange reserves. The effects are particularly large in the oil producers (Angola, Republic of Congo, and Nigeria, among others) and in countries that export iron ore (Liberia, Sierra Leone, South Africa), copper (Republic of Congo, South Africa, Zambia), and diamonds (Botswana, Namibia, South Africa). 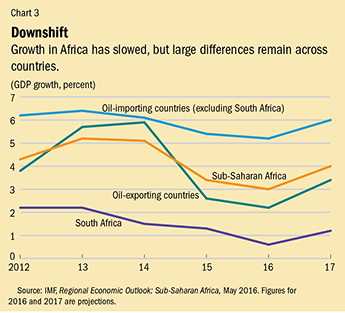 Correspondingly, growth in sub-Saharan Africa slowed from 5 percent in 2014 to 3.5 percent in 2015, and the IMF projects that it will remain subdued at 3 percent in 2016. Once again, there is wide variation, with some countries hit hard and others actually benefiting from price changes (see Chart 3). Oil exporters have seen the biggest drop in growth, alongside iron ore, copper, and diamond producers. South Africa, one of the region’s major economic engines, has been rocked by drought, falling export prices, and growing political struggles, and growth is now only about 1 percent. In Nigeria, the other regional powerhouse, last year’s successful political transition was followed by immediate challenges stemming from the steep decline in oil prices, widening fiscal and trade imbalances, and a hesitant response from policymakers. Angola, Liberia, and Zambia also have been hit hard. By contrast, most sub-Saharan African countries are oil importers, and they have benefited from the drop in fuel prices. Some countries, such as Côte d’Ivoire, have gained both from a rise in export prices (in this case, cocoa) and the drop in oil import prices. Similarly, many countries are food importers and have been helped by the decline in prices for rice, wheat, and other food products. Countries with more diversified exports are experiencing a more moderate impact on export prices, coupled with gains on the import side. Kenya, Mozambique, Rwanda, Tanzania, and Uganda are still expected to grow by 5 percent or more this year. But countries across the region face several other long-term challenges, starting with weaknesses in infrastructure for power, roads, and water (see “Impediment to Growth” in this issue of F&D). World Bank researchers estimate that infrastructure deficiencies in Africa have reduced growth by more than 2 percentage points a year. Only about one-third of rural Africans live within two kilometers of an all-season road, compared with two-thirds in other regions. And while many parts of Africa have abundant water, the lack of water storage and irrigation facilities undermines economic activity. The impact of these shortages will only grow as climate change advances. Demographic shifts present another major test. Sub-Saharan Africa’s population is projected to climb from 965 million in 2016 to 2.1 billion in 2050. Nigeria alone could have 400 million people by 2050, more than double its current size. Urban populations will grow especially quickly, posing major challenges in job creation, infrastructure, education, health, and agricultural production. But demographic shifts also provide an opportunity: history shows that population growth is not necessarily a constraint on growth. Larger urban populations, a growing share of working-age people, and increased female labor force participation all present opportunities to expand manufacturing and services—much as happened in Asia in recent decades—especially when accompanied by investment in infrastructure and education. Perhaps the most difficult challenge of all will be climate change. Temperatures in sub-Saharan Africa are expected to rise between 1.5 and 3 degrees Celsius by 2050, and weather patterns, temperatures, and rainfall are expected to be more erratic. There will be myriad effects, including a rise in sea level in coastal regions, lower water tables, more frequent storms, and adverse impacts on health. Arguably worst will be the blow to output and labor productivity in agriculture, the dominant source of income in Africa, especially for the poor. Dealing with these challenges will test the skills of Africa’s new generation of leaders. But once again, the effects are likely to vary widely: countries with the most diverse export bases will probably be affected the least, while those with narrow export bases and weak governance will suffer most. Continued long-term progress through this challenging period calls for action in four areas. First up is adroit macroeconomic management. Widening trade deficits are putting pressure on foreign exchange reserves and currencies, tempting policymakers to try to artificially hold exchange rates stable. Parallel exchange rates have begun to emerge in several countries. But since commodity prices are expected to remain low, defending fixed exchange rates is likely to lead to even bigger and more difficult exchange rate adjustments down the line. As difficult as it may be, countries must allow their currencies to depreciate to encourage exports, discourage imports, and maintain reserves. At the same time, budget deficits are widening, and with borrowing options limited, closing the gaps requires difficult choices. At the core will be the ability to mobilize domestic resources and increase tax revenues, which will allow countries to control deficits while financing critical investments in roads, power, schools, and clinics. The amounts involved are significant: Every 1 percentage point increase in revenue as a share of GDP for sub-Saharan Africa as a whole raises an additional $17 billion a year. In some countries, it might make sense to augment domestic revenue with borrowing, especially for priority infrastructure projects. But the burden of debt is accelerating, interest rates are rising, and spreads on sovereign bond issues in Africa are climbing quickly—putting the brakes on further borrowing. Second, countries must move aggressively to diversify their economies away from dependence on commodity exports. Governments must establish more favorable environments for private investment in downstream agricultural processing, manufacturing, and services (such as data entry), which can help expand job creation, accelerate long-term growth, reduce poverty, and minimize vulnerability to price volatility. The effects of the current commodity price shocks are so large precisely because countries have not diversified their economic activities. The exact steps will differ by country, but they begin with increasing agricultural productivity, creating more effective extension services, building better farm-to-market roads, ensuring that price and tariff policies do not penalize farmers, and investing in new seed and fertilizer varieties. Investments in power, roads, and water will be critical. As in east Asia, governments should coordinate public infrastructure investment in corridors, parks, and zones near population centers to benefit firms through increased access to electricity, lower transportation costs, and a pool of nearby workers, which can significantly reduce production costs. Financing these investments will require a deft combination of prudent borrowing mixed with higher domestic revenue. At the same time, the basic costs of doing business remain high in many countries. To help firms compete, governments must lower tariff rates, cut red tape, and eliminate unnecessary regulations that inhibit business growth. Now is the time to slash business costs and help firms compete domestically, regionally, and globally. Third, Africa’s surge of progress cannot persist without strong education and health systems. The increases in school enrollment and completion rates, especially for girls, are good first steps. But school quality suffers from outdated curricula, inadequate facilities, weak teacher training, insufficient local control, teacher absenteeism, and poor teacher pay. The coming years call for dramatic improvement in quality to equip students—especially girls—with the skills they need to be productive workers. Similarly, health systems remain weak, underfunded, and overburdened, as was illustrated so clearly during the recent Ebola virus disease outbreak (see “After Ebola” in this issue of F&D). Robust efforts are needed to improve access to health facilities, train providers, bolster the delivery of basic health services, and strengthen health systems more broadly. Fourth, continued long-term progress requires building institutions of good governance and deepening democracy. The transformation during the past two decades away from authoritarian rule is remarkable, but it remains incomplete. Better checks and balances on power through more effective legislative and judicial branches, increased transparency and accountability, and strengthening the voice of the people are what it takes to sustain progress. Some nondemocratic countries have done well, but the majority of authoritarian governments have been governance disasters. Finally, the international community has an important role to play. Foreign aid has helped support the surge of progress, and continued assistance will help mitigate the impacts of the current slowdown. Larger and longer-term commitments are required, especially for better-governed countries that have shown a strong commitment to progress. To the extent possible, direct budget support will help ease adjustment difficulties for countries hit hardest by commodity price shocks. In addition, donor financing for infrastructure—preferably as grants or low-interest loans—will help build the foundation for long-term growth and prosperity. Meanwhile, this is not the time for rich countries to turn inward and erect trade barriers. Rather, wealthy nations should encourage further progress and economic diversification by reducing barriers to trade for products from African countries whose economies are least developed. It is easy to be pessimistic in the current global economic environment. But of course, it is always easy to be pessimistic. Most analysts were negative about Africa’s prospects in the mid-1990s, just as many countries there were turning around and beginning to rise. There was further pessimism during the global food crisis of 2007 and the 2008–09 financial crisis. But, against all odds, many countries across the region have experienced a remarkable transformation. The global slowdown presents major challenges that will not be easily overcome. Over the next few years, growth will probably remain moderate across the region, and the pace of overall development progress is likely to slow. In some countries, especially those reliant on a few commodity exports, the slowdown could be quite significant. Policymakers may not be able to generate rapid growth right away, but they can do much to keep the slowdown in check and strengthen the foundation for lasting progress. Looking ahead over a longer-term horizon, the fundamental improvements under way in governance, capacity building, and encouraging a new generation of leaders point to favorable prospects. Steven Radelet is Director of the Global Human Development Program at Georgetown University’s Edmund A. Walsh School of Foreign Service and author of The Great Surge: The Ascent of the Developing World. Arndt, Channing, Sam Jones, and Finn Tarp, 2015, “What Is the Aggregate Economic Rate of Return to Foreign Aid?” World Bank Economic Review, July, pp. 1–29.